Muscle biopsy findings are summarised in Table 2. Conventional staining showed neurogenic changes (neurogenic atrophy, grouped atrophy, and small angular fibres) in three cases, and myopathic changes (increase of central nuclei and variable fibre diameters) in three cases. No abnormal findings were noted in one case. NADH-TR staining and ATPase staining did not show any abnormalities in Cases 10-12. 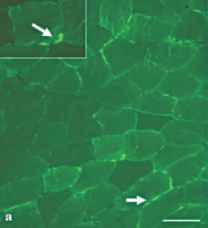 Compared with the previous reports, the severity of these changes may be milder, but may be attributable to the clinical stage at which muscle biopsy was performed. We have reported a homozygous ChAc case (Case 15 in Table 1) with abnormal histopathological findings in addition to typical clinical features of ChAc . 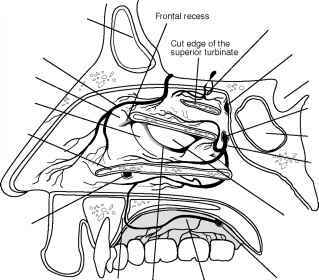 Briefly, a 37-year-old woman developed mild dysarthria and a gait disturbance in addition to the typical hyperkinetic involuntary movements (choreiform movements of the limbs and tics). Although hypotonia with hyporeflexia was noted, neither muscle weakness nor atrophy was noted. Laboratory and radiological findings were compatible with ChAc. H&E staining revealed mild neurogenic changes (grouped atrophy, small angular fibres, and fibres with some internal nuclei), while modified Gomori trichrome staining demonstrated a moderate number of collections of nemaline rods (Fig. 2). The frequency of nemaline rods was quite high and similar to that of adult-onset nemaline myopathy. There were approximately ten rod-containing myofibres per fascicle. 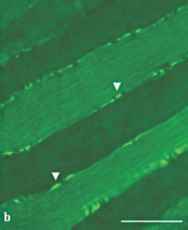 Electron microscopy showed the presence of rods in the subsarcolemmal location within myofibres. Using immunohistochemical, high pressure liquid chromatography, and Western blot analysis, Melone et al. found increased amounts of tTGase-derived Ne-(-y-glutamyl)lysine isopeptide cross-links in erythrocytes and skeletal muscles from their two ChAc cases, which also showed internal nuclei and some necrotic fibres, suggesting primary myopathic changes [5, 19]. 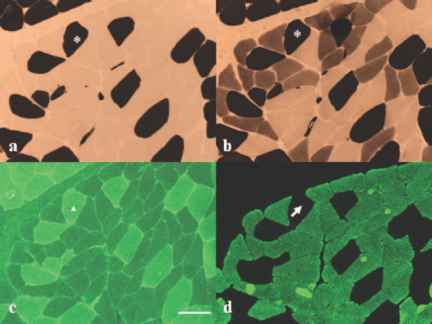 Electron microscopy demonstrated amorphous elements with osmiophilic microfibrils in degenerating myofibres and at the perinuclear level. Combined with these findings, they suggested that tTGase is involved in the production of these inclusion bodies in ChAc muscles. 2579-2592), immunohistochemical studies of skeletal muscle were performed. In normal muscle from controls, chorein immunoreactivity was found linearly along the sarcolemma and was intense in some fibres or present at a lesser degree in others (Fig. 2c). Compared with the fibre type distribution of NADH-TR and ATPase (pH = 4.6, 4.3) staining and immunohistochemistry with anti-myosin heavy chain fast antibody, chorein labeling was predominantly present in type I fibres and mainly localized in the sarcolemma (Fig. 2a, b, d). These findings suggest that the chorein function may be associated with mitochondrial activity. Muscle tissues from three heterozygous ChAc cases (Cases 10-12) showed uneven and discontinuous chorein immunoreactivity along the sarcolemma, and in some fibres an increase in chorein immunoreactivity in the sarcoplasma was also noted (Fig. 3). Those chorein accumulations along the sarcolemma were negative for ubiquitin immunostaining. These findings are not seen in typical MLS or genetically-confirmed HD (data not shown).